It seems that I have skipped Week 9 – will maybe get back to it sometime. And this week I am taking the recipe a bit further. The Outrageous Pretzel Bars are really that! They consist of a Brown Sugar Cake (Brownie-like) and are topped with a Chocolate Fudge made with Sweetened Condensed Milk and Chocolate Chips. More Chocolate Chips are put on top along with crushed Pretzels. And the recipe is huge – they were cut into 24 Bars but maybe should have been cut into 36. The bars are very chocolaty and filling and one cannot really eat much at a time. That being said, my Husband loved the Bars! He is an avid Chocolate Lover whereas I am not. But they were good, especially the next day after they had time to dry out a little. I took one-third to my Mahjong Group, froze one-third for one of my sons and we tried to eat the other third. Since my husband is very reserved as to how much he eats and I am only an occasional chocolate consumer, we did have some left over. After a week, the leftovers were thoroughly dried out and of course impossible to eat, but being the improvisor that I am, I just couldn’t throw them away. My Food Reinvention skills came about when my Sons were small and I got my first Blender. I started using leftovers to make other things. The first was gravy that I turned into soup and so on. I have a really yard time throwing food out so the Outrageous Pretzel Bars were the perfect thing to turn into something else. I broke up the leftover bars and put them into my Food Processor and chopped them up into as fine a crumb as I could. 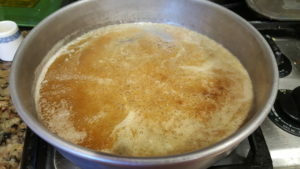 Then I added about 1/3 cup of melted Butter and 1/4 cup Granulated Sugar. 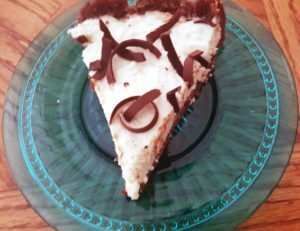 (One could just use a Graham Cracker Crust Recipe for this Chocolate Bar Crust) I did use it as a guide but the Butter called for was too much so I only used about 1/3 as stated above. Next I pressed the Crumb Mixture into the bottom of my 9″ Springform Pan and baked it for about 5 minutes. You could actually make the pie without baking the crust but the oven was already on for something else, so I did bake it. The problem with baking is that it releases some of the butter and then you have to blot it off. Next I made the Bavarian Creme. 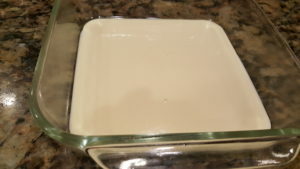 I started out by making a Vanilla Soft Custard which is the base for all Bavarian Cremes. Next I incorporated a cup of Whipped Creme into the Custard. Recipe will be found in the recipe section of this blog. 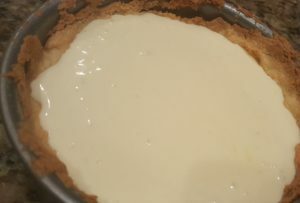 Once the Creme chilled sufficiently I poured it into the Crust and then chilled the whole thing. When it was ready to serve I took off the sides of the Springform and placed the whole thing, (bottom of pan included) on a serving plate and topped with Chocolate Curls. Next I cut it into moderate portions. The Bavarian Creme was actually much less filling than the original Pretzel Bars themselves. 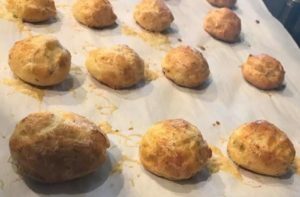 This Week’s Baking Project was Gougeres – a cheesy version of Pate Choux. 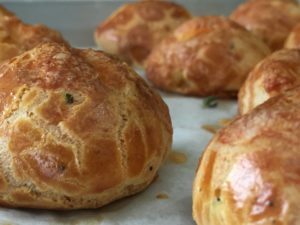 In this version the Pate Choux is made with Fat Free Milk instead of water and there is also the addition of Cheese. 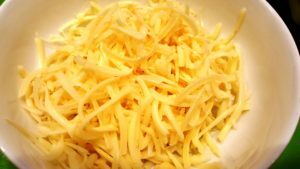 I used Gruyere but Parmesan or other types of semi-hard or hard cheeses can be used. This Project was fun and seemed to have been participated in by more members than any of the others. At least there certainly was a lot of feedback and posting of photos. 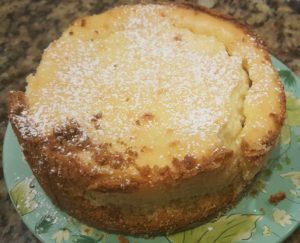 Not only was this one fun but it was relatively simple and took very little time as compared to the first few projects that we did, especially the Lemon Chiffon Cake (which I loved). 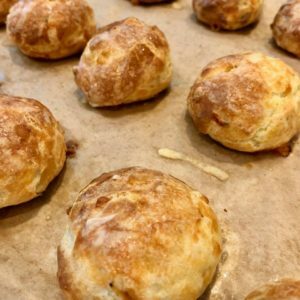 The recipe for the Gougeres is posted in the recipe section of this blog but it came from the book “Tartine” which was named after the Restaurant of the same name. 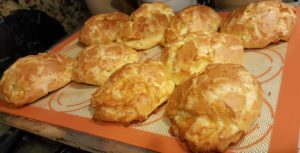 For anyone who has not made Pate Choux before or even for those of us who have, it is always fun to see the marvel of the Choux Dough Puff Up and form these marvelous pockets which can be filled with anything from an Appetizer, to a Main Course or Dessert. I used mine for Sunday Morning Breakfast with Herb and Tomato Scrambled Eggs along with a Fruit Salad dressed with Fresh Basil and Sweet Mint. 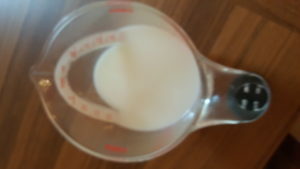 The Recipe calls for 1 cup Skim (Fat Free) Milk – I had only 2% so used half milk and 1/2 water. I may have gotten better height in the Puffs if I had only used water. 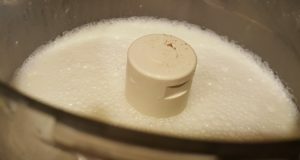 The Milk or Water (whichever you use) is brought to a boil along with the Butter over medium heat. Then the Flour is added all at one time and vigorously beaten until the mixture all comes together. 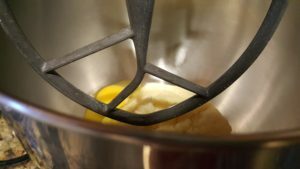 At this time, the mixture is then placed in a Standing Mixer Bowl and the Eggs are added one at a time. 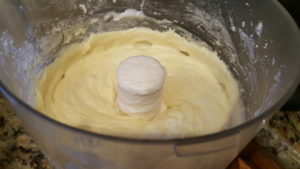 If you don’t have a mixer, this can be done by hand with a wooden spoon, but it will take some energy to do so because the Eggs need to be thoroughly beaten into the Dough. 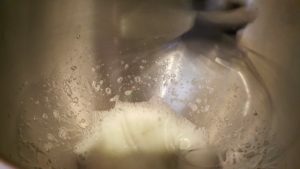 You can also use a Food Processor, but I have found when making Pate Choux n the Food Processor that you usually end up using 1 less Egg than called for. This is because the speed of the Processor is so fast that the ingredients get incorporated more thoroughly and at a faster speed. Once all the Eggs have been incorporated then you add the Cheese, Chopped Herbs and Pepper. Beat these items in by hand with a wooden spoon. 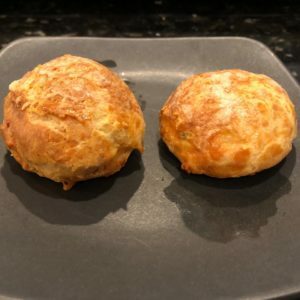 Next you can form the Gougeres on a lightly greased (I don’t usually grease the pan because there is plenty of butter in the dough but the recipe in mention does say to do so. You can also line the pan with baking parchment or use a Silicon Baking Sheet, which is my preference. 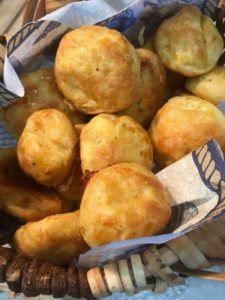 The Puffs are baked at 350 degrees for at least 25 minutes but if you want a darker and crisper puff 45 minutes is recommended. (The older recipes call for a 400 degree oven but they do seem to rise alright at 350 degrees. If you make the small size they can be eaten warm as Appetizers or accompaniment to Soup or Salad. 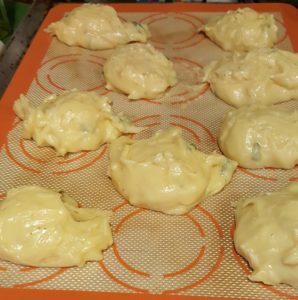 If you make the larger ones, the tops can be cut off and they can be filled with a creamed mixture or scrambled Eggs as I did. I made Soft Scrambled Eggs using the double boiler and added diced Tomatoes, Baby Spinach and Cilantro just before the Eggs were done. Serve with Bacon or Sausage and a fresh Fruit Salad. Below are the Members Photos. 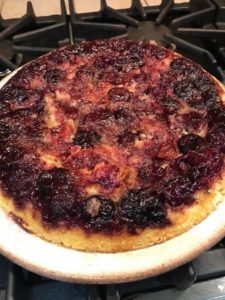 Since Cherry Season is in full swing in Southern California it was decided that a second week of baking products with Cherries was in order. 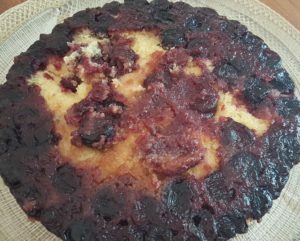 So this weeks project was Cherry/Cornmeal Upside Down Cake. 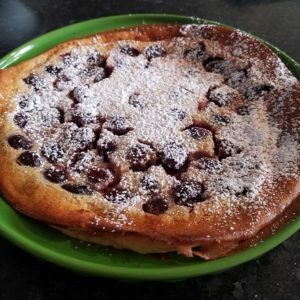 The title implies that there is a lot of Cornmeal in the batter, but there was not. However, the Cornmeal was prominent in feel and in taste. Many of the participants like or loved the Cornmeal but I did not. Maybe I was the only one who didn’t like – no one else said anything negative about it. 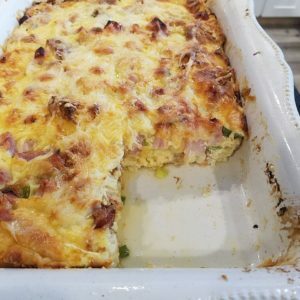 Of course, I am not a Cornbread Lover, so it figures that I would not be too found of the Cornmeal in this recipe. All that being said, it does give a little different feel and taste to the texture of the cake. One thing that I did like about this recipe was the addition of Balsamic Vinegar. i do love the taste of Balsamic and I for one think that even a little more than the recipe called for could have been used. I do use Balsamic a lot with fruit, especially summer fruits such as berries and melon. 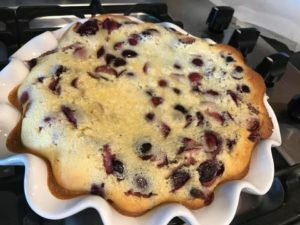 By the way, just because I am not fond of the Cornmeal in the recipe does not mean that I didn’t like it – I did like it – in fact I loved it, probably because of the Cherries which I can’t stop eating when they are in season. They are my ‘All-Time Favorite Fruit’ and there are many fruits which I absolutely love, especially Summer Fruit. 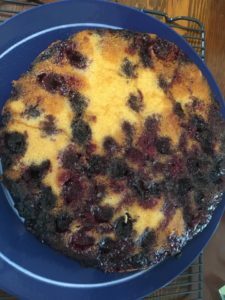 My Husband loved the Cake – in fact we ate it for Breakfast at least two times. This cake is a 10″ cake and offers up quite a few pieces. 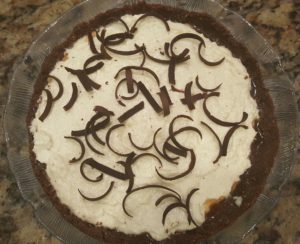 One of my Sons had it for Dessert one night and one of my Stepdaughters also had it for Dessert one night – both on a different night. The Cake keeps well and needles to say everyone who ate it loved it! With all that Hyperbole out of the way let’s get to the recipe and finished product itself. 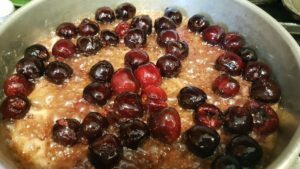 The Ingredients that you may not have on hand are 3 cups of Cherries (most of us used Bing), Balsamic Vinegar and Cornmeal. Everything else in the recipe is pretty common in most kitchens. 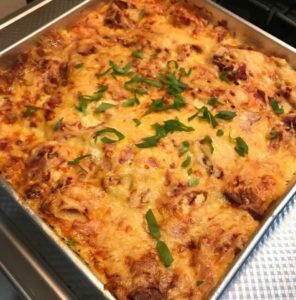 The recipe does say to use an ‘oven-proof skillet’ but if you don’t have one that can be used as a baking pan, just use a 10″ layer pan or other similar container which is what I did. Pitters can be found at your local Culinary Store or at Amazon.com. Or you can do as one of our members did and use chopsticks. You can also do it the very ‘old-fashioned’ way and use a darning needle to push out the pits. 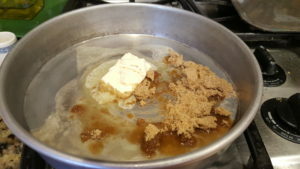 The next thing to do is to melt the Butter with the Brown Sugar and then add the Cherries and bring them to a boil. Shut off the heat after about a minute or so – just to give the Brown Sugar a chance to melt. 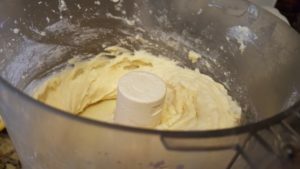 Now make your Batter – it is easiest to do this in a Food Processor but if you don’t have one then use whatever would be easiest for you. 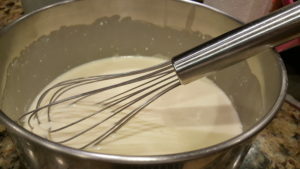 Then whip the Whites in a Standing Mixer or with a portable mixer. DO NOT TRY TO WHIP THE WHITES IN THE FOOD PROCESSOR – They will just get overheated and not whip properly. Next gently fold the Whites into the Batter. You can do this in the Food Processor but only use the Pulse Button so that you do not over-mix. After the Whites are folded into the Batter it is time to pour the Batter over the Cherries and finally to bake the cake. The Cake is baked when a toothpick or cake tester is inserted into the cake and comes out clean. 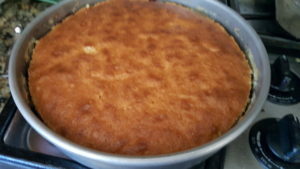 Allow the Baked Cake to cool for at least 5 minutes before inverting onto a large plate. 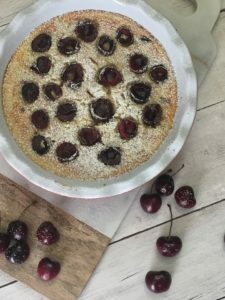 In the Photo above right, you can see that the Cherries gravitated towards the edges, but it still tasted good and when sliced and served with Ice Crema or Whipped Cream one cannot see that the Cherries are not completely covering the cake. Serve warm with Ice Cream or Whipped Cream. The Cake also tastes good cold or at room temperature. Cherries are a relatively expensive fruit but when you consider that their season is so short you may be a little more inclined to spend the money on them if you can. I can remember when the price was way lower than they are now but things have changed and Farm Workers are now making more of a ‘living wage’ when they were decades ago. And if you think you are paying a lot of money for Cherries just look at what Christine Rola Biskaduros had to pay for them. 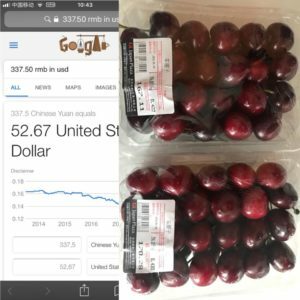 (Photo above right) Christine lives in Shanghai and I guess the Cherries were imported although I did think that Cherries do grow in China but I may be wrong. June is Cherry Season in California and they are plentiful indeed! 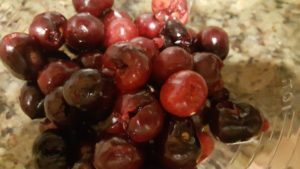 All the Markets are featuring them and they are readily available at your local Farmer’s Market where you know they have recently been picked – no shipping, no mishandling – just great fresh Cherries. Both Bing and Ranier are available but for today’s recipe we are using Bing. Bing provide much more color and flavor and are perfect for baking. 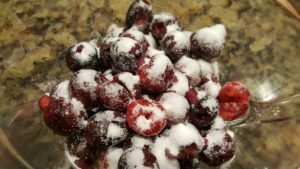 If you are lucky enough to be close to Cherry Orchards (we used to go to Cherry Valley in Beaumont) to pick Cherries when I was growing up and I won’t tell you what the price was then – you would flip as you compare it to what we are paying today. When my sons were young we went to Leona Valley which is North of the Conjeo – prices were still good then as compared to today. One of the great things about taking your children to pick Cherries is that (at least when we did it) the owners said you could eat what you want as you were picking them. Don’t worry – it didn’t hurt the farmers as you can only eat so many as you are picking. 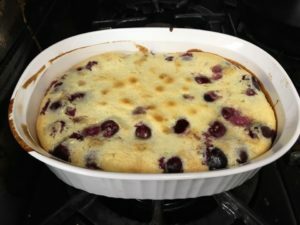 To make the Cherry Clafoutis, you have to pit the Cherries. When I was growing my Mother and I used to use a darning needle to push the pits out of the Cherries. You can imagine how long that took. Today you can buy Cherry Pitters to help you do the job. I have one that pits the Cherries one at a time and one that does it in multiples. 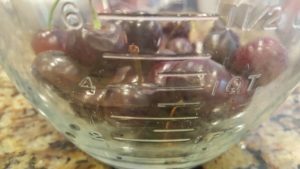 The one that does it in multiples is from Germany and does a great job, but you do have to sort through the pitted Cherries to make sure that all the pits were removed. it is easy for one or two to get through the chute without having their pits removed. There are multiple Cherry Pitters available at Amazon – enough to confuse you about which one to buy. 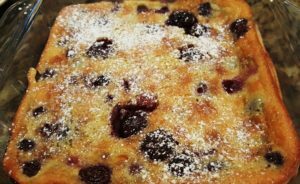 The recipe for the Cherry Clafoutis is available at ‘Bake from Scratch’. 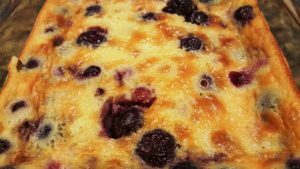 Just click on the previous ‘Cherry Clafoutis’ and you will get there. 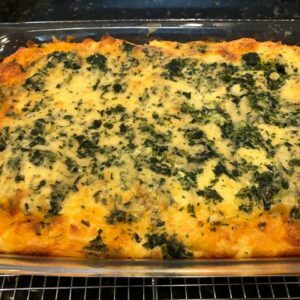 I used to teach this recipe to my International Food Classes – there are a few differences between the one I used and this one. I think that I prefer this one more because I love Cream and this is what this one uses. My old recipe used Milk and this one uses Cream. 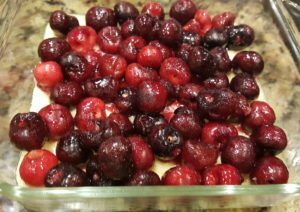 In addition, my old recipe just had you putting the Cherries on the bottom of the pan and this one has you baking a thin layer of the Custard before adding the Cherries. 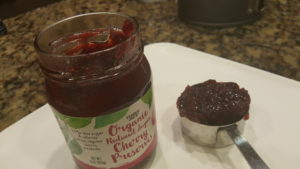 This makes it much easier to serve and get those luscious cherries on each serving. 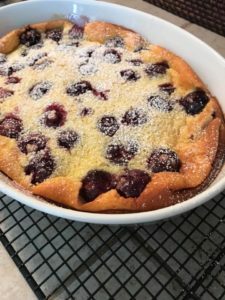 One you get the Cherries pitted, it is quick and easy to make – the Clafoutis is best served warm but it can also be served cold. We like it with Whipped Cream but Ice Cream is good too or you can just serve it as is. 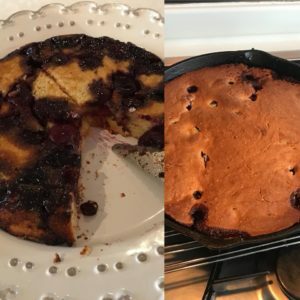 When you read the recipe you will be amazed that originally the pits were left in the Cherries – you can imagine what eating it must have been like! The reason that the pits were left was for the flavor but today the flavor of the pits is replaced with Almond Flavoring. The reason for this is that Almonds, Peaches and Cherries all have similar flavor characteristics. Just compare a Peach Pit with an Almond and you will see the similarity. I know a Cherry Pit does not look like an Almond or a Peach but the flavor profile is very similar. 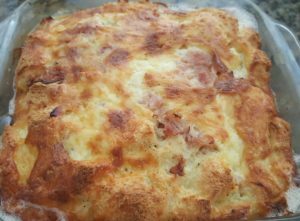 Ham and Cheese Brioche Pudding was the selection for Week 4. It was decided upon as a nice contrast to the sweet selections from the previous weeks. Unlike the previous 3 selections which we loved, this one will not go on my favorites list. 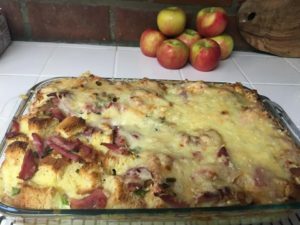 My Husband and I both love Bread Pudding, but as a sweet dish; it turns out that the savory version is not so palatable for us. 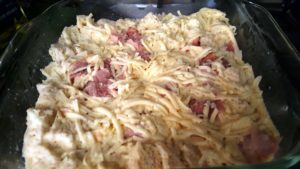 I am not a fan of Ham but my Husband likes it, and eats Ham and Cheese Sandwiches at least once a week, if not more often, so I decided to stick with the Ham and Cheese Version. The Bread portion of the Pudding is Brioche. I used Challah which is very similar to Brioche. 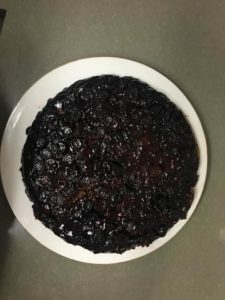 The Pudding itself was beautiful – it raised up and was a beautiful golden brown and had a great texture but would have been more to our liking if it had apples, raisins and some brown sugar in it. 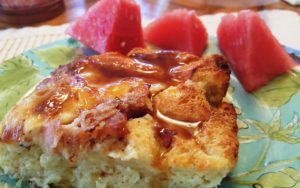 I served the Brioche Pudding for Breakfast along with Maple Syrup and Watermelon on the side. 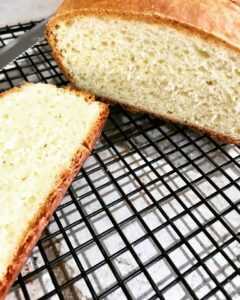 To make the Pudding you cut up 12 ounces of Brioche or other similar bread (I used Challah which is very similar to Brioche) and place in a buttered baking dish (12” x 12” or even 10” x 10” will do). I made half a recipe and used an 8” x 8” dish which was perfect. 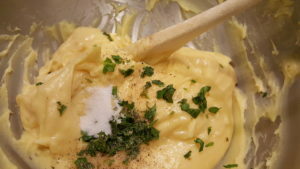 Combine the Eggs, Milk or Cream or Half and Half along with the seasonings which are Salt, Pepper, Cayenne and Nutmeg. 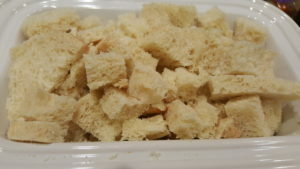 Pour the Custard mixture over the bread cubes and top with Julienned Ham and Shredded Cheese. In the photos above you may see that the Bread and Custard Cubes are in a different dish than the product with the Ham and Cheese. 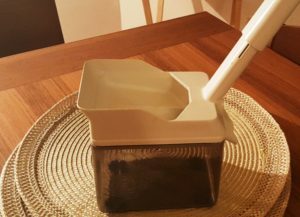 I mistakenly thought that the half recipe would fit in my ceramic loaf dish but not to be – had to transfer the mixture to my 8 x 8 glass baking dish. Press everything down so that the bread absorbs the custard and the Ham and Cheese are incorporated into the whole. Slivered Green Onions (which I omitted) are sprinkled on top. 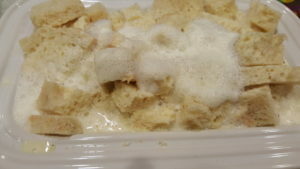 Normally Bread Pudding is assembled and then refrigerated overnight so that all the custard is absorbed into the bread. 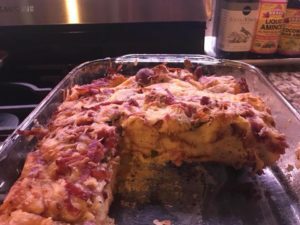 This recipe did not call for that but since we were going to eat it for breakfast, I did do that. I made it in a glass baking dish, so I had to let it warm up for about an hour before baking it. The baking took 45 minutes, exactly what was called for in the recipe. 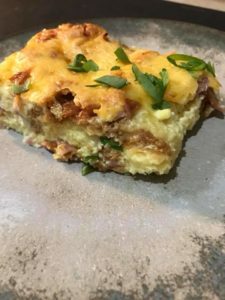 The Pudding should be served immediately or it can be baked and cooled and then cut up into squares as suggested in the recipe or you can just reheat any leftovers that you may have. 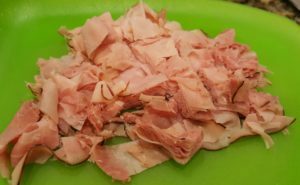 Even though I only made a half recipe we still had leftovers which I sent home with my Grandson who loves Ham. I have yet to hear if he has eaten it and if he likes it. Will notate that here when I find out. 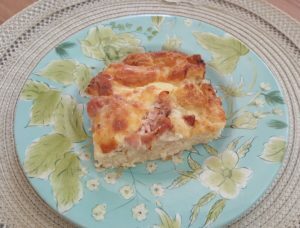 I am sure that many people will like this version of Bread Pudding, especially if you are a fan of Quiche. I do like Quiche but never make it with Ham. I usually use Spinach or Mushrooms. I am a Vegie Fan, but not a Vegetarian or Vegan. I am thinking though of becoming a Pescatarian. I do not get stuffed when I eat fish and/or vegetables like I do when I eat meat. 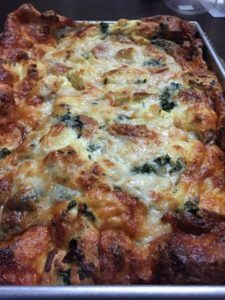 There are variations among the members of our group – some did use Spinach, another used Bacon, etc. And a couple of the members made the Brioche Loaf from the recipe that was given. 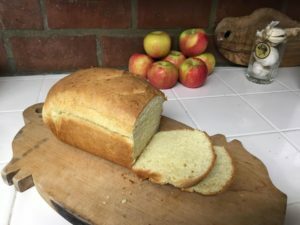 I did make my bread but it was Challah and since I had it on hand decided to use that instead since it is very similar, both in ingredients used and the end result. 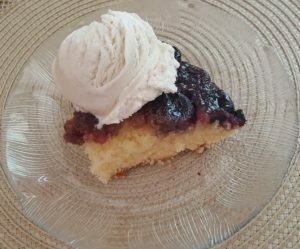 A Very Berry Torte was the selection for Week Three of our Sunday Baking Project. 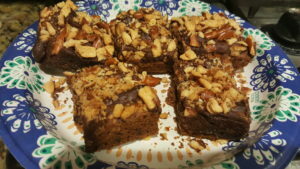 The recipe was selected from the book – Baking from My Home to Yours by Dorie Greenspan. 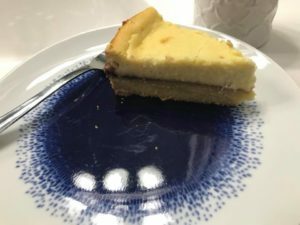 The Torte consisted of a Cookie Crust which differs from the traditional Graham Cracker Crust in that you actually make it from a Sugar Cookie Dough. Jam goes on the bottom and the Cheese Cake Filling goes over the top. 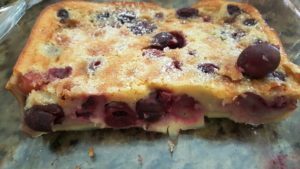 It is made in a Spring Form pan which allows you to remove the cake without destroying it – this is especially good when the crust is quite fragile due to the ingredients it is made with. 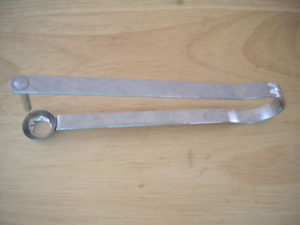 A Spring Form Pan has sides that lock on to the bottom and by use of a spring lock can be removed once the baked product is finished. If you don’t have a Springform Pan you can purchase one at your local Culinary Store or on line at Amazon.com. The Filling was also a little different than the traditional Cheesecake in that in addition to Cream Cheese it also had Cottage Cheese in the Filling. 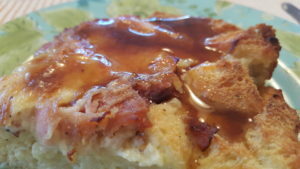 The Cottage Cheese helped to give the filling a little more texture than normal which turned out quite well. 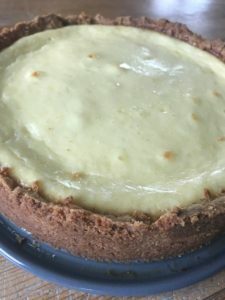 The preparation of the Torte begins with the Crust which is pretty similar to a traditional Sugar Cookie Dough and it certainly behaves like one in that it is not super easy to work with. To roll the Dough out with as little trouble as possible it is best to refrigerate it first. I did this by flattening the dough into a circle between two pieces of waxed paper. When you do roll it out it is best to roll it between the sheets of waxed paper so it doesn’t break up. You can also press the dough into the Springform pan although I don’t think you can get as even a crust as you would like with this method. After the Dough is rolled out it is then refrigerated for 30 minutes before baking. To bake the Crust it is best to use a ‘Blind Filling’- a sheet of buttered Aluminum Foil placed on the Dough with Pie Weights. The Weights can be purchased or you can use dried beans. 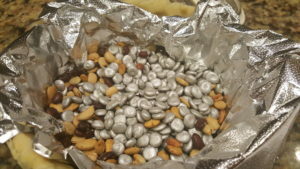 The beans can be stored in an airtight container and used again many times as of course the weights can. The Weights come in various forms – some are metal, others are ceramic. They all work in pretty much the same way and whatever you buy would be up to you. The recipe said to bake the crust for 30 minutes before removing the weights, but I found that to be a little too long. Try it yourself with different times – every oven is a little different so what I tell you may not work in your oven. I would start out with the suggested time and then adjust it from there if you plan to make the torte again. After the foil and Weights are removed the crust is returned to the oven for about 5 more minutes to brown the surface. I personally thought the crust was over-done and would definitely try it with less time or maybe not pre-bake at all. If I do bake the Torte without prebaking the Crust I will come back here and post the results. 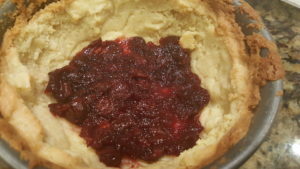 The Jam is spread over the baked crust – to my taste, 1/3 cup of Jam was not enough to cover the bottom of the crust – next time I would use at least half cup or maybe even more. 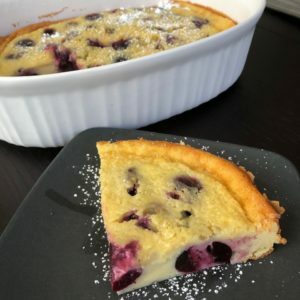 It is supposed a Berry Tart and you do want to be able to taste it. 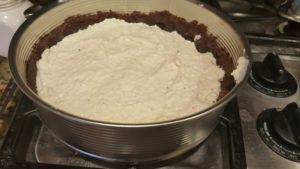 To make the Filling the the Cottage Cheese and Cream Cheese are first blended together. Then the Sugar, Salt and Spices are blended and then the Eggs are beaten in. This can all be done in the Food Processor or by hand in a large bowl with a whisk. I think the Food Processor (if you have one) is the preferred method. Much faster and the ingredients will be beaten more thoroughly than if you do it by hand. 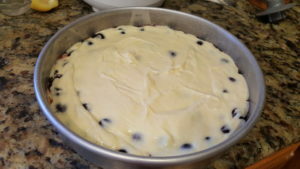 The Torte should bake for about 60 minutes or until the filling no longer jiggles when the pan is moved. Additional cooking will take place after the heat is shut off and the pan is taken out of the oven. 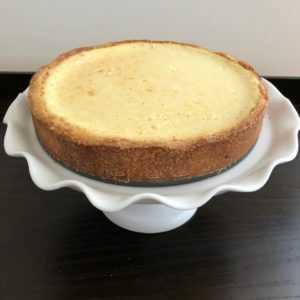 In the older methods of making Cheesecake the instructions say to leave it in the oven (after it has been turned off). I haven’t checked my old recipes but I think the actual baking time would be less. 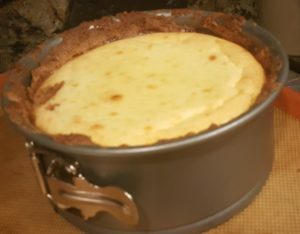 i have the bad habit of over-baking my cheesecakes so if I looked up the old method it would probably be better for me to do it that way. 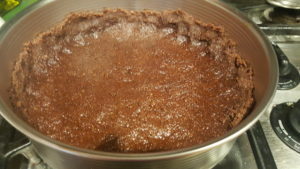 In the Baked Torte photo you can see the clasp that holds the circular sides onto the bottom of the pan. When the Torte is baked and cooled the clasp is opened and should slide right off. Oftentimes you may have to use a straight-edge spatula to completely separate the cake from the pan. 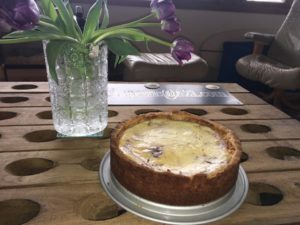 All in all, this Berry Torte Cheesecake was very good – it tasted delicious even if my version didn’t come out looking beautiful. 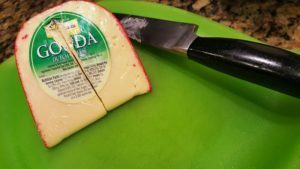 We had it for Breakfast – after all it does contain Eggs, Cheese and Fruit – items that we often incorporate into our Breakfasts. Of course we didn’t eat the whole thing at once, so it was also eaten for Dessert at another meal. 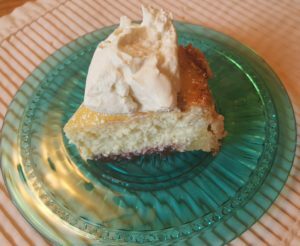 In the photos below are the plated cake and a slice topped with Whipped Cream.